Here's a Pileated Woodpecker from last winter. Thanks to Prairie Birder for the FOF idea. Finally, I went through the pictures from the Oak Hammock Marsh Christmas Bird Count, and finally I'm making a post. One of our parents friends met us at our house at seven and we set out to Oak Hammock Marsh. 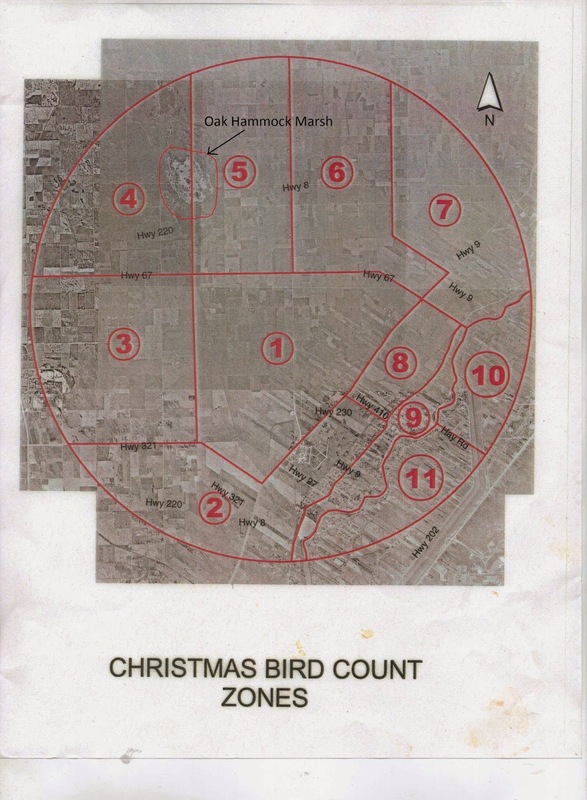 We were teamed with Christian to scour Zone 5 for birds. It was very very empty and open, so not as many of the woodland birds were as easy to find. We set out in our van, we decided to check down the road, even though it wasn't in our zone, for a Snowy Owl. I thought it would be funny if that was the first bird we saw that day, because we hadn't seen any yet, the sun hadn't even risen. Sure enough, just after I was thinking it, Christian called out. Up ahead a Snowy Owl was sitting on a pole. We took out our cameras and began snapping. As many of you know, a Snowy Owl is a lifer, one I have been trying to see for a long time, but has evaded me thus far. It was quite special for it to be the first bird of the count. After staying a bit and taking many pictures (and hearing some Snow Buntings and Lapland Longspurs), we headed on into our 'territory'. We stopped to check out a few places, and while walking through a bit of bush, encountered to large dogs! Though they didn't come too near us, and they looked friendly enough, I believe a St. Bernard and a Newfoundland dog (two dogs I really love). And since driving slowly down the road, stopping at half the people driveways, and staring into their yards is suspicious, we had quite a few people staring with their dogs beside them, and asking if we were okay, and even picture taking of our licence plate. We counted magpies, ravens, redpolls and some others. We soon found another owl. It flew across a field to a water pump, I find when it is perching here it looks a lot like Gyrfalcon, except the squarish head. After counting a while more, we encountered another owl, which was pure white, a very beautiful bird! Not a mark of black on it's plumage, except for a tiny bit on the top of it's head. And, while it yawned, so I was able to get a picture of it! It's pretty cute actually. Now what is this? If you hadn't seen the previous pictures you could be wondering. It looks like a lump of snow stacked on a post, but no, this is the owl. We stopped at an old abandoned house to see what we could see, owls often roost in old barns. We checked a couple but didn't find anything. Yes.... this was a very old house, seeing as a tree grew right through this machine. In another abandoned yard we checked, a Great-horned Owl flew out of some trees and across the field to a power line. We got a few pictures before it flew away further. Near the end of the count we spotted some birds in some trees. Christian identified them, White-winged Crossbill! They were a lifer at the time, and the first crossbill species I'd seen. At about 12:30 we headed back to the interpretive center to count up all the data, and also had lunch. We were one species away from a tie for the most species, if the Snow Buntings and Lapland Longspur was in our square, we would have had the most. We counted 12 species all together, one less than last years count. As we headed out, we stopped to see where we first saw the Snowy Owl. Soon enough, we found it perched on a pole, so we were able to get a series of photos of it, and a few flight shots. As we drive slowly by and stopped for a minute, it got uncomfortable with us and flew to the next pole. And it flew again! William got the good flying pictures. We drove slowly past, and apparently it still didn't like that. I thought we should leave it alone now. It flew one last time, this time across a field and on a different pole. Now it would get some peace, or maybe not... another car had already stopped and was watching it. It was a fantastic time, with two lifers (three for William, the Lapland Longspur was a first for him), and some great pictures! Thanks Christian for spending the time with us! For some reason blogger isn't uploading the pictures at full size so I just cropped it quite a bit. Last weeks, as Bridget suggested, was a Great-horned Owl. One we saw on the Oak Hammock Marsh CBC. When we were out with Christian looking for rare birds, we found lots of robins, over 40. I was able to get some good photos of them in a berry tree. Can you guess this bird from last spring? Last weeks was indeed a young Turkey Vulture. My brother saw it, and it's a very unusual sighting for this time of year. My twin brother Matthew and I were out snowmobiling when very unexpectedly the Great-horned Owl that has been coming back for a few years flew out in front of us. I didn't think it would come this year, I hadn't seen it since today, and it usually comes in early December. I walk the dog everyday at least once, and I hadn't seen it, so I think it may have just showed up today. I'm very glad it came back, now there's a bird always to look forward too when I walk outback (hopefully (but also hopefully I don't disturb it everyday)). I'll try and get some photos of it, but it is very difficult, as I learned from last year and the year before. Since I made several large posts in the last week or two, the Churchill post has already been flushed to the next page! If you haven't read it yet, you can view it here: Churchill Day 4. Please comment or share. Today we went with Christian Artuso on a rarity hunt, we found the Eurasian Tree Sparrow, but couldn't find the Varied Thrush and Townsend's Solitaire which we were also looking for. I will make a post fairly soon. I now have 200 species! We also saw some Hoary Redpolls, which I have probably seen before, but I didn't have it on my eBird lifelist, so that makes 201 sp.! As I said in my Feathers on Friday, I knew one day a flock of birds would come to eat our berries in our forest. I predicted right, and about a hundred Bohemian Waxwings came to our yard for several days and ate all of them. I was able to do a few photoshoots and get some fantastic action shots of them eating berries. I was so close to them, there were always good photo opportunities. I took 500 pictures in 45 minutes. There were so many good ones, and this post was getting long, so I had to cut down the number, even though there are lots more good pictures. Also, I have seen White-winged and Red Crossbills this year, a special treat, I have not seen them any other winters. There was a whole flock of Red Crossbills, but only two White-winged. I was standing right under a tree with both White-winged Crossbills. I wasn't able to really get any very good pictures because the branches blocked them most of the time, but I managed to get this. Every minute some spruce cones would fall from a tree, bounce of a few branches and hit the ground. It was really fun watching them (though my neck got sore from staring up so long) pick at the cones and drop them. The next day I saw a flock of Red Crossbills. It seemed they were taking shifts with the White-winged, every day they alternated. I was able to get some photos of them probing at a cone, sticking their beak in it. I don't know if this is a dull male, a young male, or a female. Then came the Bohemian Waxwings! I was on my way home from taking pictures of the Red Crossbills when I first spotted them. I love this picture, three Bohemian Waxwings sitting side by side on a cold winter's day. The next day I got some even better pictures. A flock of BOWA in a tree. I wandered around through the bushes getting as close as I could to them as they ate the berries. Bohemian Waxwing swallowing berry "Gulp!" Reaching out to grab a berry. I love this shot with it's wings spread wide, and in focus. And the occasional chickadee was around. And this one... Well, you get the picture! Tossing up a berry in the air, I love this one too (as you can guess)! Flying away with the berry. Steadying itself in a tree. This one is just grabbing a berry. These were maybe some of the best pictures I've ever taken! Close anyway.